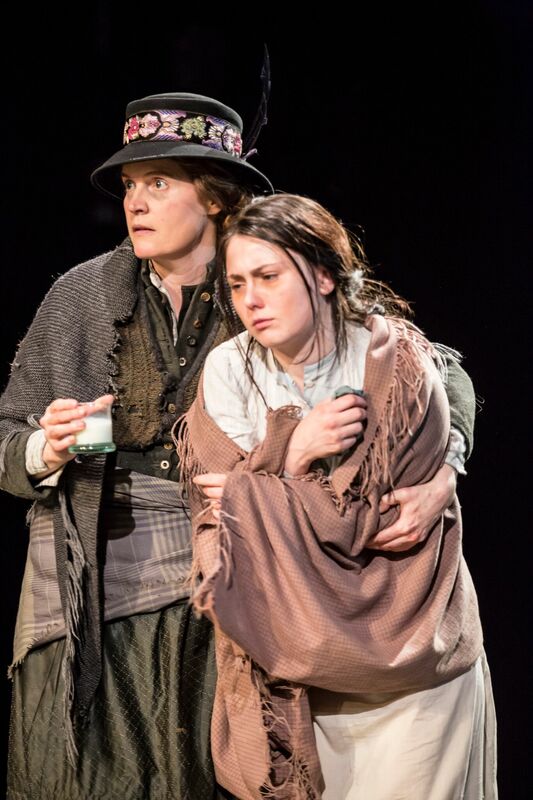 The Plough and the Stars by Sean O’Casey opened at the National Theatre last night (27th July). 2016 is the 100th anniversary of the Easter Rising, the background to this piece. The play tells of a group of people living in a tenement building. Act 1 opens in the lead up to the Easter Rising and spends time building up the characters and establishing relationships. This is a show that focuses on the people in order to portray the underlying historical story. We meet Nora and her husband Jack Clitheroe. It soon becomes apparent that Nora disapproves of Jack’s political activities. This doesn’t stop Jack when he is called upon to become Commandant in Chief of the Irish Citizen Army, sending Nora into a downward spiral. We also meet Nora’s uncle, Peter Flynn, who constantly butts heads with Nora’s cousin, ‘The Young Covey,’ a communist. Mrs Grogan, a witty and outspoken woman whose child, Mollser is ill with consumption, Fluther Good and Bessie Burgess, a Protestant whose son is fighting on the front add to the plethora of personalities and political and religious viewpoints. Tensions begin to escalate in Act 2 with tensions reaching fever pitch and fights breaking out in a public house. Act 3 and Act 4 depict Easter week itself and the mood turns sharply to one of joviality to tragedy. The characters begin put their own differences aside and depict the human struggle behind this religious and political battle. The acting by all in The Plough and the Stars is superb. Nora Clitheroe played by Judith Roddy transforms herself from a doting, well presented wife to a mad woman consumed by grief. Her portrayal of Nora in Act 4 is utterly heart breaking. Bessie Burgess played by Justine Mitchell and Mrs Grogan played by Josie Walker have some of the best comic lines of the show, which just about stops the piece from becoming too melancholy and they deliver them with panache. These characters all benefit from being extremely well written and as you learn more about these women and their own struggles you really empathise with the situation they have found themselves in and how they pull together to cope. The set by Vicki Mortimer is huge and impressive with the crumbling tenement house being depicted from both inside and out. The stark contrast of the huge set compared to the cast could mean that some of the intimacy of the piece is lost however it simply sought to highlight the characters insignificance in the turmoil of the Easter Rising. The accents are heavy from all of the cast, with the script often sounding like poetry. This results in it being a struggle to understand everything the cast is saying, causing problems if you are not overly familiar with the history of the Easter Rising and trying to place the political and historical references. At times, in particular in Act 1 and Act 2, the plot can be slow. As the focus is often on the mundanity of their lives there is little excitement until the Rising itself occurs. It is therefore a show that requires concentration to watch, which in it’s own way took away from any emotion I may have felt by the ending. As a lover of theatre it felt like I ought to love The Plough and The Stars: a period drama told from an alternative perspective with impressive sets and quality acting however it didn’t quite hit home for me. 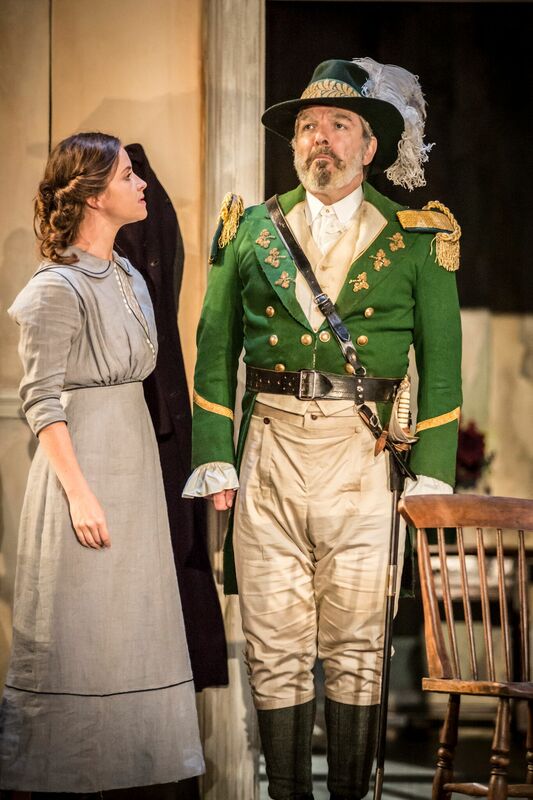 The Plough and the Stars is on at The National Theatre (Lyttleton Theatre) until the 22nd October. Tickets can be purchased here.